What inspired you to write WYWM? The idea of telling Rosaline's story came to me when I was going through a heartbreak of my own--- I knew this was the book I had to write. I know so many girls have had someone pull a Romeo on them. I wrote it for all of us! It's pretty remarkable. This was really the only professional goal I ever had (I'm terrible at just about everything else) so to realize it is just amazing. I'm really, really lucky. 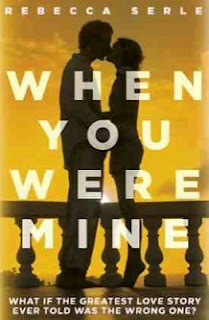 If When you were mine was made into a movie what actor/actress would you love to see play the characters? If Rosalie and Charlie were stuck on a desert island together what 3 things each do you think they would bring? 1) A journal so she could write--- letters to Rob, probably. 2) Sunscreen--- she's got light skin! 3) A cell phone. Rosaline is pragmatic. I think she'd want to figure out how to get out of there. 1) Music so they could dance. 2) Make-up-- hey, she'd still want to look good! If you could go to dinner with any of your novels characters who would it be and where would you go to eat? I'd probably go to dinner with Len. I kind of have a crush on him, to be honest. What one song would suit Rosaline and Rob relationship right now?